Caesar's Palace was where I was staying during this trip. I took the picture on the 36th floor from the window of my very large double-Queen bed room, that had enough floor area to accommodate another round table for 4, a writing desk as well as a sofa + coffee table set, with room to spare. The best part? It didn't cost me a cent as the room was comped by the casino host. However, before anyone misunderstood me for being some big shot gambler, I'm afraid I'll have to disappoint you here. It was a friend of mine who has the privilege of being the Big Whale and the room comp was courtesy of him. Before anyone thinks that I kio tio gu lan with a free room for the week, let me assure you that there is no such thing as free in Vegas. My room was complimentary on account of a loss of USD 300,000.00 at the Baccarat table, the month before when my friend was in Vegas. So remember this. 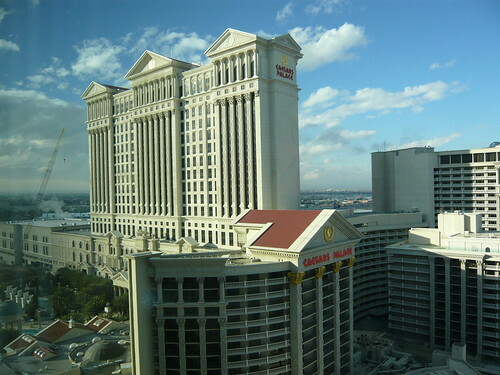 The most expensive hotel rooms in Vegas are the free ones.